LINCOLN PARK — The best description of Spikeball is it's the love child of volleyball and four square. The Chicago-based 2-on-2 game has adopted North Avenue Beach as its unofficial home court. And over the last few years, it's spread nationwide. Spikeball has evolved from a fun, casual game between friends to a sport. In Chicago, there's a weekly league. There have also already been a number of tournaments, including one this summer that drew 55 teams. "When we go down to North Avenue Beach, we will set up at 9 or 10 a.m. on a Saturday and people will stop on their bikes, stop on their rollerblades and just ask us what is going on," said Chris Ruder, "chief baller" and owner of the Wicker Park-based company, Spikeball, that the sport has spawned. Ruder estimates there are thousands of players across the country. Spikeball's rules are simple, and all you need to play is an inflatable ball and a mini-net that looks like a trampoline straight out of an '80s workout tape. The complete set costs $50. Once the ball is served — or spiked — off the net, the receiving team has three touches, like volleyball, to hit it back off the net. "It's affordable. You can take it anywhere. 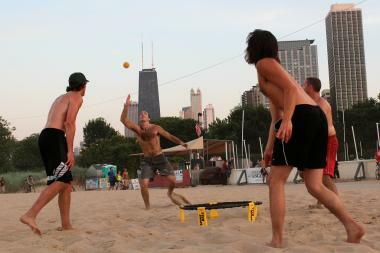 It's a good beach game," said Devin Shea, a 30-year-old Logan Square resident who has been playing Spikeball for more than two years. "You only see people playing volleyball, Frisbee, or throwing a ball around, and this is something new." There are now Spikeball tournaments being played all over the country, including in Los Angeles, New York, rural Georgia and Iowa, according to Ruder. "Originally we thought Chicago would be the main hub," he said. "Chicago's still one of our top markets, but Nashville, of all cities, is our No. 1 market, which is fantastic. I'm not exactly sure how that happened." Ruder, a 38-year-old father of three, runs the company out of his home, and business is exploding. It took a few years to get to this point on a tight budget, but perseverance has paid off. "We took the friends and family route. We had no money for advertising. We had not money for big partnerships," Ruder said. "Our advertising was essentially going to the beach and playing." On any given Saturday if the sun is out, Spikeballs can be seen flying through the air and sweaty players can be seen diving all over the beach to get that ball back to the net. It's a fast-paced game and causes traffic jams along the already packed portion of the lakefront trail along North Avenue Beach. "Biking accidents are usually caused by us," Ruder said. Spikeball's rise in popularity even got it a spot on ESPN2's SportsNation last month, during which the host exclaimed "It’s about time someone came up with a good new sport." "It wasn't too long ago that Spikeball Chris [Ruder] asked us to come over and help him package up Spikeball sets because he was selling so many," Shea said. "Just to see the game around on the beach has been pretty crazy." The best players in the world hail from Chico, Calif., according to Ruder. There are also great Spikeballers on the East Coast, and a few in Chicago. By the end of the year Ruder hopes to release a national ranking system of the top teams and individual players based on data from tournaments across the country. "People just assume it’s a West Coast thing, and I love correcting them and telling them, 'No, this is a Chicago game,'" Ruder said. "California just happened to pick up on it a little later."